Typical in-dash navigation and entertainment systems are terrible. Apple CarPlay offers less distracted driving. Many new cars come with in-dash navigation and entertainment systems created by automobile makers. For safer, less-distracted driving, they should use Apple CarPlay instead. That’s the result of a study done by AAA that compared CarPlay to Google’s Android Auto and the native infotainment systems found in five 2017/2018 vehicles. The research looked at visual (eyes-off-road) demand and cognitive (mental) demand required for common tasks. That includes making a phone call, sending a text message, queuing up audio entertainment, and programming the navigation system. Overall, both CarPlay and Android Auto proved superior to automakers’ own systems. “CarPlay and Android Auto systems generated an overall moderate level of demand, whereas the built-in (native) systems led to overall very high levels of demand,” says the key finding of the AAA study. Researchers also found that CarPlay requires less driver attention than Google’s offering when sending texts. That said, Apple’s system still has room for improvement. Android Auto imposes lower overall demand when programming GPS, according to the study. AAA summed up its results by pointing out that just because CarPlay and Android Auto result in less distracted driving than native infotainment systems, that doesn’t mean they aren’t distracting. “Motorists should only use these technologies for legitimate emergencies or urgent, driver-related purposes,” AAA said. What the heck is CarPlay? For those unfamiliar with CarPlay, Apple’s in-car system attempts to simplify common iPhone tasks for drivers. “CarPlay takes the things you want to do with your iPhone while driving and puts them right on your car’s built-in display. You can get directions, make calls, send and receive messages, and listen to music,” according to Apple. 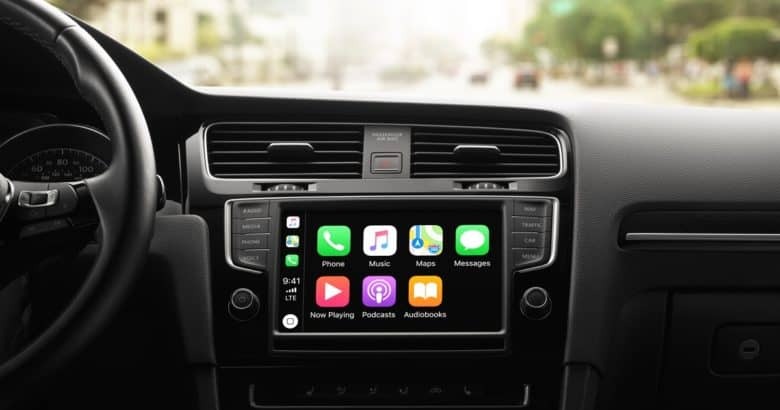 CarPlay is available in over 400 models from companies including Ford, Chrysler, Chevrolet, Volkswagen, Honda, Toyota, Subaru, BMW, Hyundai and more. Those shopping for a new vehicle might check to see which models offer it. Alternatively, Pioneer, Kenwood and others sell CarPlay-compatible aftermarket systems. This in-dash system depends tremendously on Apple Maps, which happily is about to get a major upgrade. And, thinking long-term, Apple might build a whole car rather than just an infotainment system. Update: This article was updated on July 1 at 7:20 p.m. Pacific with information about aftermarket infotainment systems.